Once upon a time in a far away kingdom....Oh wait, I've been watching too many fairy tale movies with my three year old. The real life fairy tale is now a decade and a half old. I married my college sweetheart in 1999, five days after graduation. We are not the same kids that marched down the aisle 14 years ago, our health has changed as much as our appearances. Life keeps getting busier and the time for preparing and planning meals in advance is eaten up by other responsibilities. Our healthy eating habits slipped away over the last few years and it's beginning to show. The one thing that hasn't changed is the nagging question everyday WHAT'S FOR DINNER? I think about it all day when I'm trying to work, my husband and daughter will ask it the minute I step through the door before I even get my coat off. A sudden illness has resulted in my husband being put on a very strict diet. So I am trying to gather healthy alternatives to meals that we love. 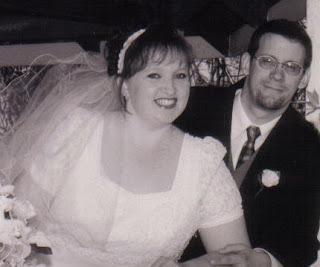 You may be wondering why I do all the cooking when my hubby is Mr.Mom while I'm work, but let's leave that query for another day...With our 14th wedding anniversary days away, I tried to come up with a recipe that would be tasty, healthy, and still special enough for a celebration. 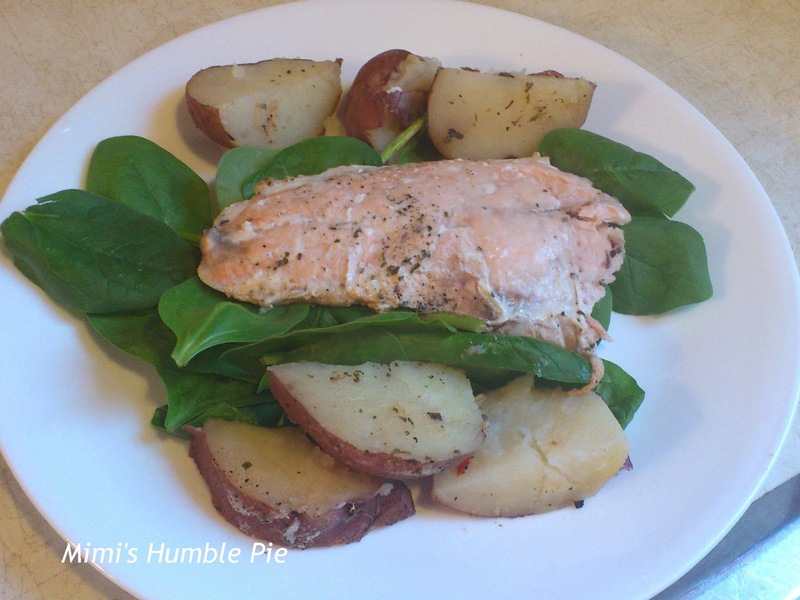 After brainstorming and wandering the grocery aisles I thought of a salmon recipe I used to cook a few years ago. My potatoes would normally be pan roasted in oil because we like the crispy texture. I think I will do them separately on a bbq grill pan this summer to see how they turn out. Choose a dish to fit the fillet before starting prep. 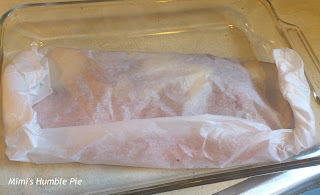 Line a baking dish with parchment paper (cut it twice as long as your baking dish). Washed and cut potatoes into even sized into wedges. Steam the potatoes for 8-10 minutes. I use a microwave steamer. 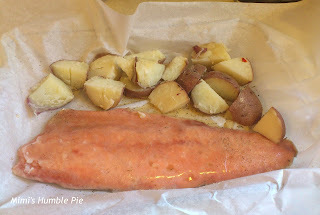 Place the fillet and potatoes into the parchment lined dish. Pour the liquid ingredients over the fillet and sprinkle the herbs, salt, pepper, and garlic over all the contents. Fold the parchment and tightly roll the long side first, then roll each end. I don't slice any holes in my parchment because I want it to cook faster. Place in your oven and bake at 375 degrees for 35-40 minutes. The fillet should make four dinner size portions. Serve it over a bed of spinach after spooning a little of the poaching liquid over the spinach to wilt it a bit. I do not preheat my oven when using a frozen fillet in a glass dish. The cold dish may crack when it touches the hot oven rack. Tip: If you don't have a microwave steamer, leave the potatoes whole and microwave on a glass plate for 12 minutes after pricking all over with a fork. Cut the microwaved potatoes into wedges then continue on with step four of the recipe. Oh, yummy! LOVE this! My 4 year old loves salmon, so I think we'll have to make this sometime this week! Thanks for sharing!